Nintendo Switch has been treated to lots of Toki Tori love just recently; the end of February saw a re-release of Toki Tori 2+ with some very welcome new features, and now the original game has found its way to the console, too. If these latest versions are the first you’ve seen of the titular little chicken, and you’ve therefore never played the first entry, you might be surprised to learn that this game is very different to its newer counterpart. Toki Tori was originally released way back in 2001 on the Game Boy Color (and you can actually grab this edition right now on the 3DS Virtual Console), before seeing re-masters of sorts appear on the Wii and Wii U. Over time, the core foundations of the game have remained true to those from its earliest form, albeit with some useful enhancements and fresh coats of HD paint, but it still stands out as a very rewarding – and very tricky – puzzle game. 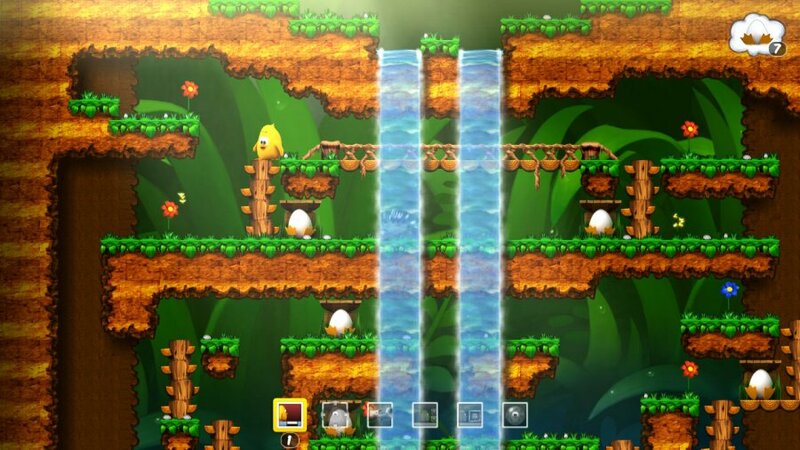 The game tasks you with guiding Toki Tori around multiple levels split across five worlds, collecting all of your egg-siblings along the way. The catch is that he has no jumping, flying, or fighting abilities, meaning that a slow waddle is almost all you have to move around. Luckily for him, and for you, each level gives you a limited amount of various power-ups (such as a teleport, bridges, and blocks) which must be used to make your way around. The first few levels are extremely simple, with menus popping up to teach you how the various power-ups work and to enable you to get a true sense of what needs to be achieved. It doesn’t take long for things to get a little trickier, though, with many levels turning out to be deceptively tough; you’ll soon find that each power-up you have must be used in exactly the right place on the level and, if you accidentally use a bridge instead of a block right at the start, you might find that you’re one bridge short right at the end. This could have been a very frustrating experience indeed, but an incredibly welcome rewind feature actually turns it into one of the game’s highlight features. By holding down the ‘Y’ button, you can rewind each level to the point where you feel you made a mistake, and then simply carry on from that point. The beauty of this is that it enables you to play around with some trial and error runs if you can’t envisage the perfect path; messing up isn’t a problem when you can simply undo your last steps. Each of the five worlds on offer has a set of regular levels to complete, alongside optional ‘hard’ and ‘bonus’ levels, both of which will stump even the most well-practiced puzzle minds out there. The regular levels are already difficult enough (we were starting to feel the pressure towards the end of world three and beyond), so having these extra tough offerings will no doubt please those looking for a serious challenge. 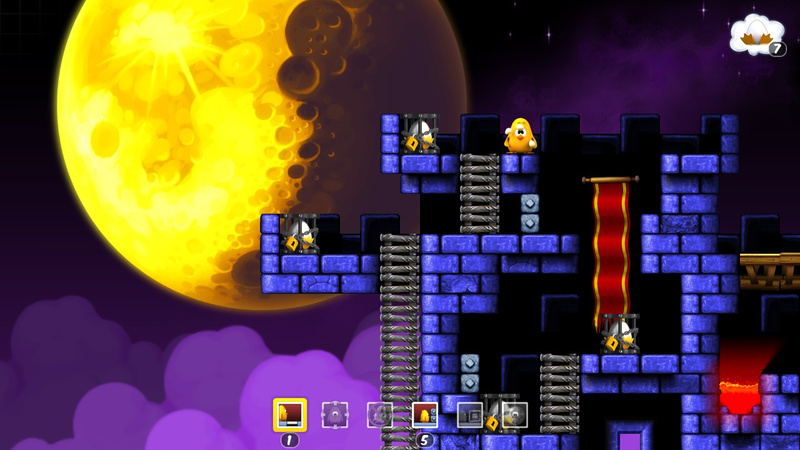 Despite being at this relatively high level, it has to be said that Toki Tori’s difficulty is hard in the ‘right’ way. By this, we mean that the game is tough because it forces you to plan out each level to an exact perfection, rather than being tricky due to any infuriating mechanics that are out of your control. The entire collection of levels almost teases you as you play; as the minutes pass by, with you blankly staring at the screen in desperation, your mind starts to wonder whether or not it can actually be done. Of course, the answer to this is always ‘yes’. Should you get really stuck on a level, you can actually pause the game to select a ‘Wildcard’ option. This will enable you to pass on to the next level, but you have to be careful; you are only given one of these skip abilities, and once you’ve spent it you’ll need to complete the particular level it was used on in the future to have it returned to you. Performance wise, Toki Tori is great. Running at a smooth 60fps, supported by a charmingly attractive re-paint of the Game Boy classic, the game is very easy on the eyes, while a slightly repetitive – but cute and catchy – soundtrack will have you humming along whenever you get stuck for too long. HD rumble is supported (which is minimal, but welcome), and you’ll be able to capture videos directly onto your Switch from launch, enabling you to share tricky puzzle solutions with your friends. Unfortunately, though, the level editor mode that is available in the PC version of the game is still a no-show here, and the optional touchscreen controls that were present in the Wii U edition are strangely missing, too. The touchscreen functionality is hardly important – you can simply play in handheld mode with buttons as usual – but it surprised us to see the feature dropped this time around. In some ways, the Switch version of the game is the best one available thanks to its beautiful presentation and portable capabilities, but if you already own the game on any of these other platforms, and have half a mind on double-dipping, you might find that this will have to be stacked up against the missing features. Either way, though, the gaming action itself is great fun and the asking price (especially if you’re reading this during the game’s launch discount period) makes it worth every penny. 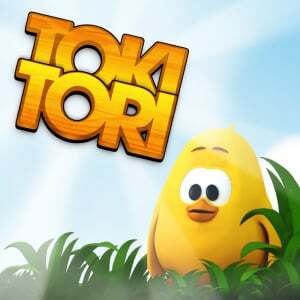 Toki Tori is a charming, fun, and pleasingly tricky puzzle game that will put your mind to the test in simple, but challenging levels. While the goal always seems almost too easy on the surface, the game’s deceptive nature actually forces players to come up with perfect solutions throughout – which is no easy task! 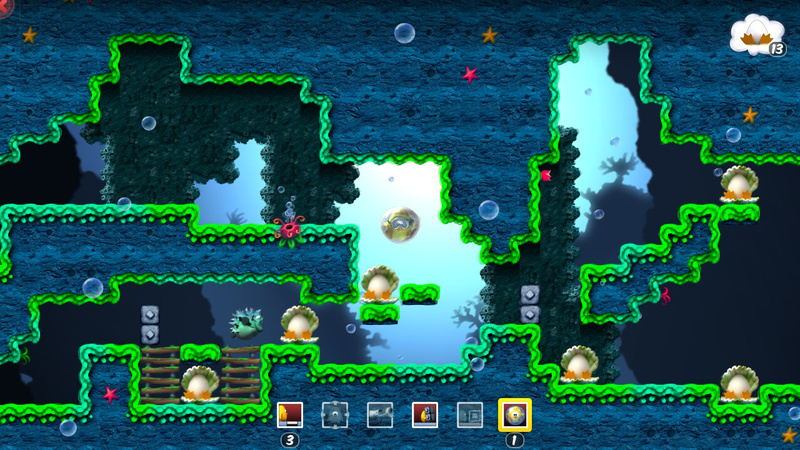 The fact that the game’s level editor still hasn’t made its way from PC to consoles is a shame, as creating levels on the fly could have worked nicely, but the puzzles themselves should be enough to justify a purchase to those who have never played the game before. 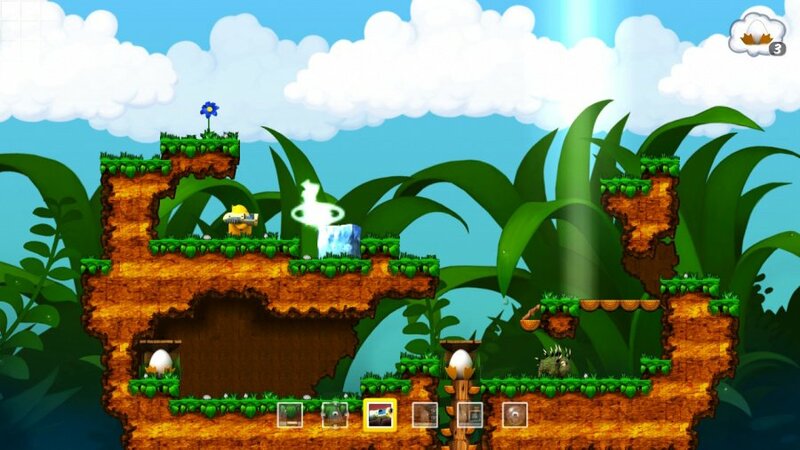 Might have to grab both Toki Tori games. Used my expiring gold points, plus the pre-order discount, to buy this for about 40p. Loved it on the 3DS. Many many hours available in this if you want to beat everything. I enjoyed the game on 3DS, but eventually hit levels that took hours to solve (including one that I never could solve). Having said that, there were plenty of levels before that that I did enjoy. I got my money's worth. But completionists - beware. Reminds me, must try Two Tribes other outing on the Switch, Rive - reviews were favourable. I've never played these so I might give this one a try since it's inexpensive. @Tandy255 Am glad I'm not the only one that took a long time to solve puzzles. Considering the difficulty of Toki Tori it's hard to believe it was originally a Gameboy Colour game. Does anyone know if the second game is easier than this? Am hoping so! If this was branded as a Minions game, it will be a lot more popular. I remember playing this back in the 60's on my Commodore 64. I've heard really good things about the game but I don't really know what to think about it, honestly. That introductory price of $5 is a steal. Clever puzzles and fun game easily worth the price and gameplay hours. It's nice that we got these games, they are classics. Thanks for the review and hope you guys all enjoy playing the game!